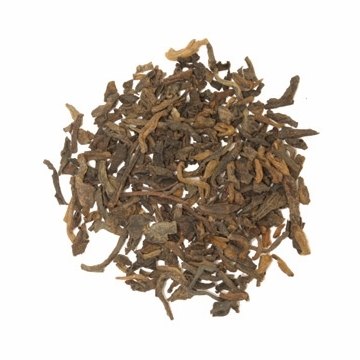 This ripen Puerh Tea is from Yunnan provenience in China. Quality Yunnan tea leaves and buds are selected for post fermentation that allows the tea to fully ripen. The ripen tea are allowed to age for around 2 years. Doctors in Kunming reported that drinking this tea helps to lower cholesterol levels in the blood stream and helps digestion. The Puerh with dark and reddish black leaves makes a heavy thick tea with strong earthy aroma. 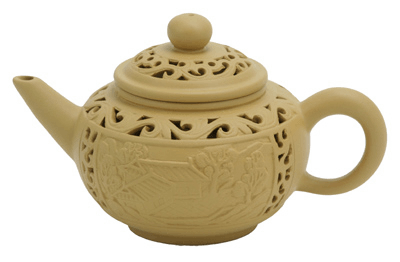 It is very popular in the Cantonese Tea House and normally consume with Dim Sum. 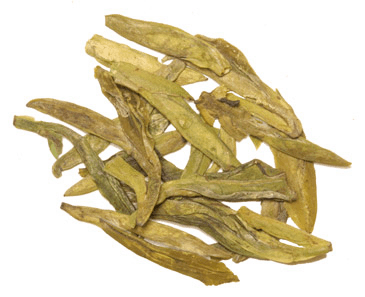 This tea is commonly mixed with chrysanthemum flower to create a Chinese Restaurant Tea. Free shipping with purchase over $60. I enjoy introducing my friends to this deep rich tea. Very nice flavor and taste. I get multiple steeps out of each serving. This Perth is earthy but mild. I add cinnamon or anise to give it added flavor. I wouldn't say it's a really fantastic puerh tea, but it's perfectly fine and in my experience it's extraordinarily cheap for puerh. If I were buying puerh tea in large quantities, this would probably be the one I choose. This tea has an earthy flavor, smooth a.d a color darker than most coffees. Perfect start for a busy day. healthy drink and not overly bitter like other teas I have had. I do enjoy drinking this tea multiple times a week. Are you an iced tea lover? The Young Ripened Puerh Tea makes the BEST iced tea. the taste is a bit strong like coffee but I will get used to it. I tried drinking it cold also but it tastes much better hot. I would tell others not to dismiss it just because of the strong taste just give it time to get used to it and to keep in mind the health benefits of the tea. Although if they can drink coffee then the taste should not bother them. This is a nice smooth tea that blends well with other teas. This is a nice tea with a mild flavor. It is earthy as most Puerh teas but lighter than aged Puerh. I took an idea from another review and added anise seeds, this is excellent. I drink four cups of this tea every morning for the last several years. Tried this for its belief to assist with reducing bad cholesterol and lowering triglycerides. Not a definitive taste so I mix in some black Rose or Scottish tea to add flavor. So far, so good! I use this if I have something serious to think about. A heavier earthy flavor. I enjoy this tea in the evening when i am coming down from all the days issues. love the taste , its not strong I enjoy it in the afternoon. I really like this tea. This is my second experience with puerh tea, the first time I tried the aged puerh. This tea is similar to the aged puerh, but it is not as earthy. This tea is probably great for someone who wants the health benefit of puerh, but wants a less earthy tasting one. After tasting both I like the aged one a lot better, but will appreciatively drink this one since it is less than half the cost of the aged puerh. Young ripened Puerh tea is a little strong and bold, but has a nice flavor and aroma. I drink this tea for the health benefits. Because the puerh tea is so earthy, I blend it with the cinnamon chunks or anise seeds. Yummy! i could see it was a Good quality Tea! I just didnt care for the taste! Im sure it has medicinal qualities tho! This is a very good puerh. It has a very deep, earthy scent. The flavor isn't as strong as one might suspect from the smell (though brewing methods impact the strength). It has a dark, carmel-like hint of sweetness. Full bodied and smooth. It's delicious.